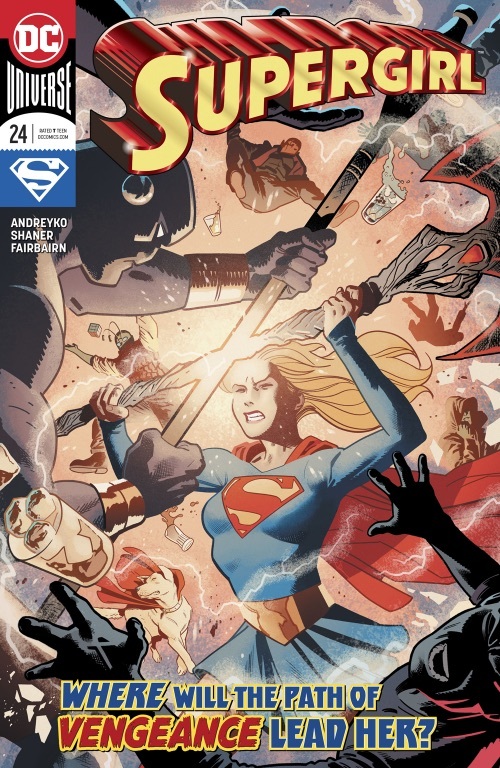 "A (Super)Girl Walks into a Bar"
Stop me if you have heard this one before... A Supergirl walks into a bar... Just as the title suggests this issue continues Kara's search for answers to the claims Rogol Zaar made that he is the being responsible for the destruction of Krypton. Ambush Bug is getting booed off the stage when people notice the Kryptonian crest poking out from under Kara's cloak. When Kara asks if anyone knows anything about a Rogol Zaar they try and brush it off as if they have no clue. No one steps forward, so Kara says, "Tell me or I will make you tell me, either way works for me." Gandelo, is informed that Kara has been located and says he has an "Independent contractor at the ready" to deal with her. After some harsh words at the bar, a brawl breaks out. 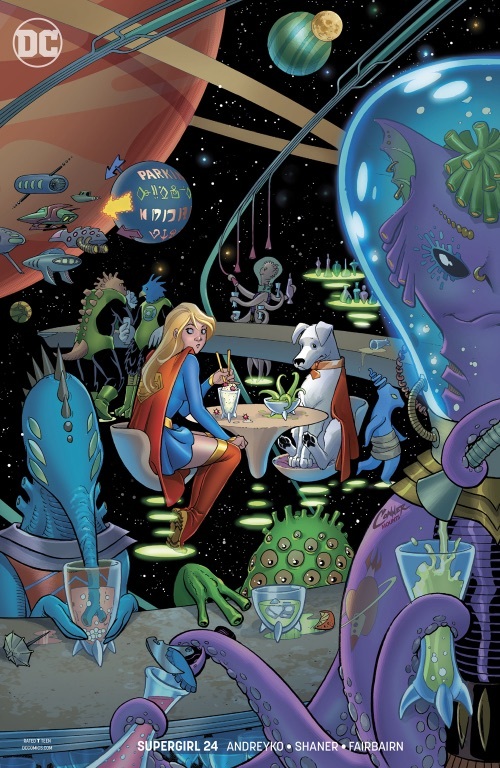 Krypto joins in the fray, but with Kara not being around Earth's yellow sun to recharge her powers she is soon overtaken by the crowd of patrons. A large creature raises his weapon and is about to put Kara down for good when Kara reveals the axe of Rogol Zaar and uses it defend herself. Immediately the crowd backs away from her and some even praise her as the "The Axe Queen". A creature is about to tell Kara what he knows when he is shot down by another. She finds another crystal like the one that was given to her last issue, and picks up a "traveling companion" named Z'ndr Kol who convinces her to take him off planet. As the ship travels through space, Kara gets really ill as they find themselves smack dab in the middle where Krypton once was. Story - 5: The last time I reviewed this book, I said not much really happened, and while I can say the same for this issue, now that the pace of this story has clearly been set, I know what to expect and I am enjoying the ride. A couple of questions arose from this issue: Just how fast is this little ship she is traveling in? If Krypton is 27.1 light years away. How much time has past since she left Earth? Also the way everyone cowards before Zaar's axe makes me wonder what power this axe has, or just how feared is this creature is across the galaxy. Once again Andreyko is weaving a tale of mystery that leaves the reader wanting more. Art - 4: This issue has a different artist since this story arc started. Doc Shaner brings his talent to this title and doesn't disappoint. His action scenes are clean and easy to follow. While I thought the coloring was a tad heavy it was not enough to deter from the overall enjoyment of the book. Cover Art - 3: This cover simply does not work for me and I really can't put my finger on it. It depicts the turning point in the story which, as you may know, I enjoy when a cover shows you something that is to come, and not just a pretty picture. Maybe it's the awkward "glare" that is shown as the two weapons collide. I am just not sure. Either way it is not the worst cover by far and I don't totally dislike it, but comparing it to the last few, this one simply does not live up.